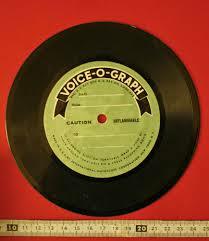 The Voice-O-Graph, which allowed people to record their own voices direct to disc, was once a staple of fairgrounds, game arcades, tourist attractions and the like. Most famously, there was one on the 86th-floor observation deck of the Empire State Building. You would step inside, pop coins (35 cents in ’47) into the slot, and deliver your own 65-second song, poem or message of undying love; the machine would then feed it out on a 6-inch disc that could be mailed to friends or relatives, who could listen to it on their home record players. leading archive companies and corporations to include 1000's ofprivate clients.